DUBAI, United Arab Emirates—Over the last six years, residents of Dubai have seen it grow out of a 141-foot hole in the ground, to stretch 2,717 feet (828 meters) into the Gulf sky. But now the shimmering spire that is the Burj Khalifa can finally enter the record book as the world’s tallest building, after a spectacular opening ceremony on Monday night. The unveiling of the $1.5 billion project came after two months of bad press for Dubai, which has seen the emirate accused of being unable to repay its debt. “Crises come and go, and cities move on,” Mohamed Alabbar, chairman of Emaar Properties, the state-owned developer of the building, told reporters Monday. The building, which was originally called the Burj Dubai, was renamed on Monday night in honor of the Abu Dhabi ruler, Sheikh Khalifa Bin Zayed Al Nahyan, who is also the country’s president. However, the speculation over the reasons behind the renaming may threaten to overshadow the opening of the building itself. A month before, Al Nahyan had authorized a $10 billion bailout, after Dubai’s largest state-owned conglomerate appeared unable to repay its debt on time. Conditions of the bailout package were not immediately revealed, but Jim Krane, author of City of Gold: Dubai and the Dream of Capitalism, believes the renaming must have been one of them. “If it wasn’t a direct condition of the bailout, then it would certainly look like a particularly generous gesture of goodwill,” he said. The renaming of the tower hit the city by surprise. On Monday, the emirate’s Road and Transport Authority opened a ‘Burj Dubai Metro Station’—unaware that the signage would need to be replaced the day afterward. The exact height of the building had remained a closely guarded secret until it was unveiled at the opening ceremony on Monday as 828 meters—a full 10 meters higher than pundits had speculated it to be. More than 12,000 workers toiled split shifts at a salary of only US$4.57 a day to build the tower in the record time of 1,325 days. Exactly 24,348 panels were used to build the exterior walls. There is enough glass in the building to cover 14 football pitches. Around 12,000 people are expected to live and work in the tower, and 90 percent of the properties are sold. However, investors in the 1,044 residential apartments in the building have already faced losses, after property prices dropped 40 percent in Dubai from 2008 rates. The building easily dwarfs its 508-meter-tall rival residential building, the Taipei 101 tower, and the 629 meter KVLY-TV mast in North Dakota. 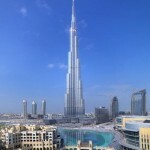 The design of the Burj Khalifa has tested the limits of engineering. Not least in terms of the building’s reaction to the wind. Skidmore, Owings & Merrill (SOM), the Chicago-based engineering and construction firm behind the project, shaped the contours of the building in such a way that they mitigate against the swaying effect at the very peak. In addition, the foundations of the building—which stands close to the sea—faced the risk of corrosion from salt water. To combat that, SOM ensured that the 192 metal stakes that form the foundation of the building are positively-charged, salt-resistant electric cathodes. 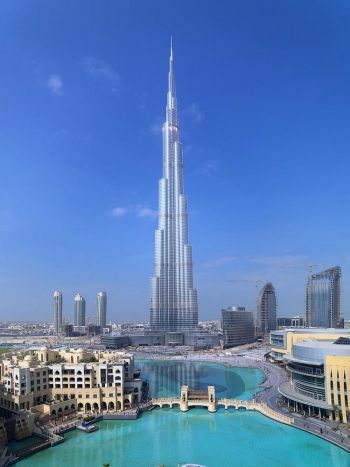 According to Krane, the Burj Khalifa is the most significant building in the Arab world since the 14th century, and as a result will inevitably draw tourists in their millions. Tours to the 124th floor of the building start from Jan. 5 and cost $27.